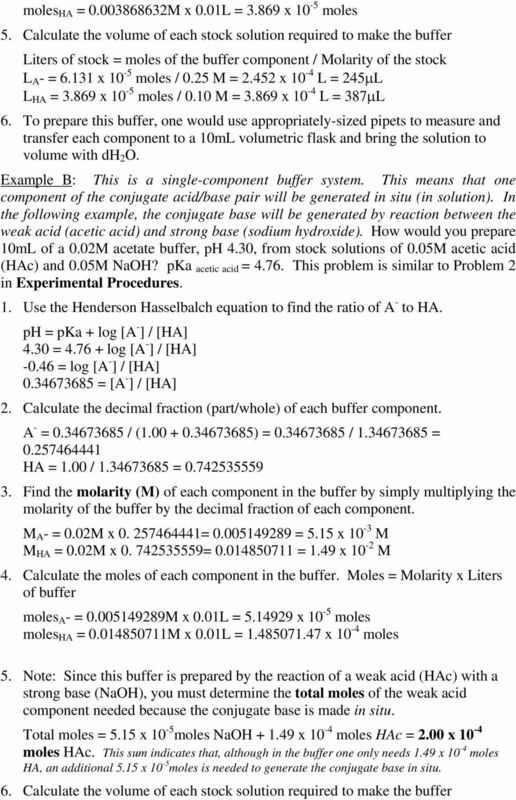 Download "3 The Preparation of Buffers at Desired ph"
5 Liters of stock = Moles of the buffer component / Molarity of the stock L A - = x 10-5 moles / 0.05 M = 1.03 x 10-3 L NaOH = 1.0mL L HA = 2.00 x 10-4 moles / 0.05 M = 4.00 x 10-3 L CH 3 COOH = 4.0mL 7. To prepare this buffer, one would use appropriately sized pipets or cylinders to measure and transfer each component to a 10 ml volumetric flask and bring the solution to volume with dh 2 O. Example C: What is the ph of a solution resulting from a mixture of 200 ml of 0.1 M NaOH and 100 ml of 0.3 M HAc? This problem is similar to Problem 3 in Experimental Procedures. It is a limiting reagent type problem. 1. Calculate the initial moles of each reactant. Moles = Molarity x Liters Moles NaOH = 0.1M x 0.2L = 0.02moles Moles HAc = 0.3M x 0.1L = 0.03moles 2. Write the balanced equation for this reaction. Note: This is a neutralization reaction. NaOH + HAc Na + Ac - + H + OH - 3. Determine the moles of each reactant remaining after the reaction. Recall: This is a limiting reagent type problem. Since NaOH is present in the least amount and, according to the balanced equation the reactants react in a 1:1 ratio, the NaOH is completely consumed (i.e., zero moles of NaOH remain). Because the reactants react in a 1:1 ratio, Moles HAc remaining = Moles HAc initial Moles HAc reacted = 0.03moles 0.02moles = 0.01moles 4. 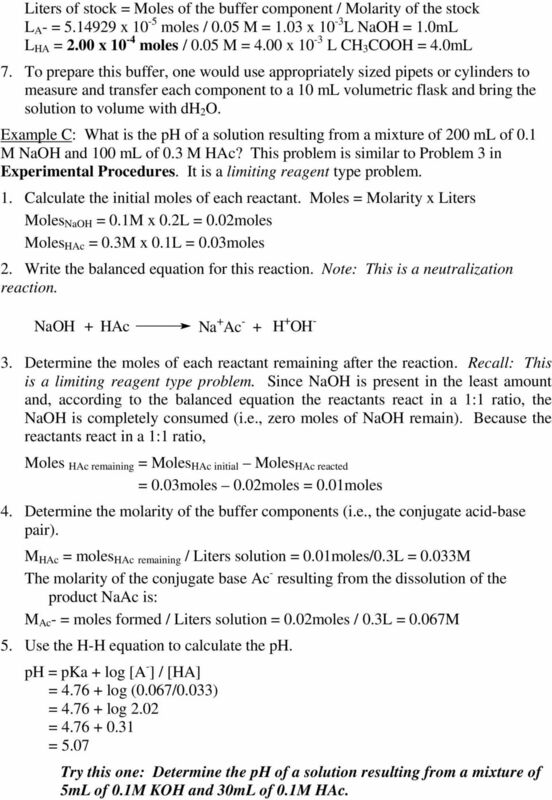 Determine the molarity of the buffer components (i.e., the conjugate acid-base pair). M HAc = moles HAc remaining / Liters solution = 0.01moles/0.3L = 0.033M The molarity of the conjugate base Ac - resulting from the dissolution of the product NaAc is: M Ac - = moles formed / Liters solution = 0.02moles / 0.3L = 0.067M 5. Use the H-H equation to calculate the ph. ph = pka + log [A - ] / [HA] = log (0.067/0.033) = log 2.02 = = 5.07 Try this one: Determine the ph of a solution resulting from a mixture of 5mL of 0.1M KOH and 30mL of 0.1M HAc. 6 Experimental Procedures: 1. Prepare 10 ml of a 0.01 M phosphate buffer, ph 7.70, from stock solutions of 0.1 M K 2 HPO 4 and 0.2 M KH 2 PO 4. (pka for the weak acid = 7.20). A. 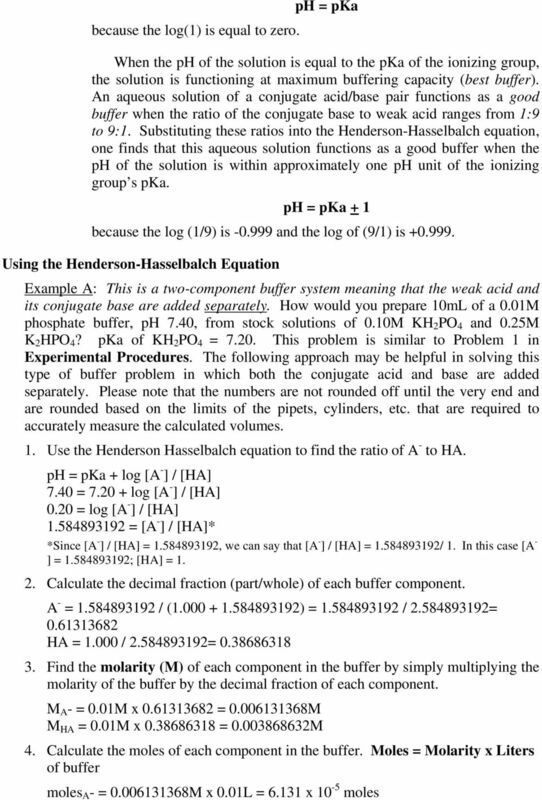 Use the Henderson-Hasselbalch equation to calculate the volume of each stock solution needed. 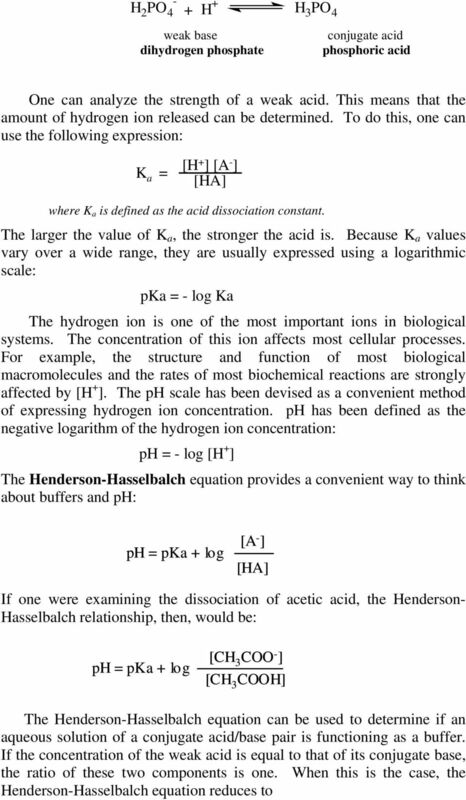 ph = pka + log [conjugate base] / [weak acid] B. Check your calculations with other students. See the instructor if there is uncertainty. C. Make the solution and check the ph of a portion of your buffer solution using the ph meter. (Instructions are on page 33) 2. Prepare 10 ml of 0.01 M acetate buffer, ph 3.80, from stock solutions of 0.1 M acetic acid and 0.02 M sodium hydroxide. pka acetic acid = A. C. See above. 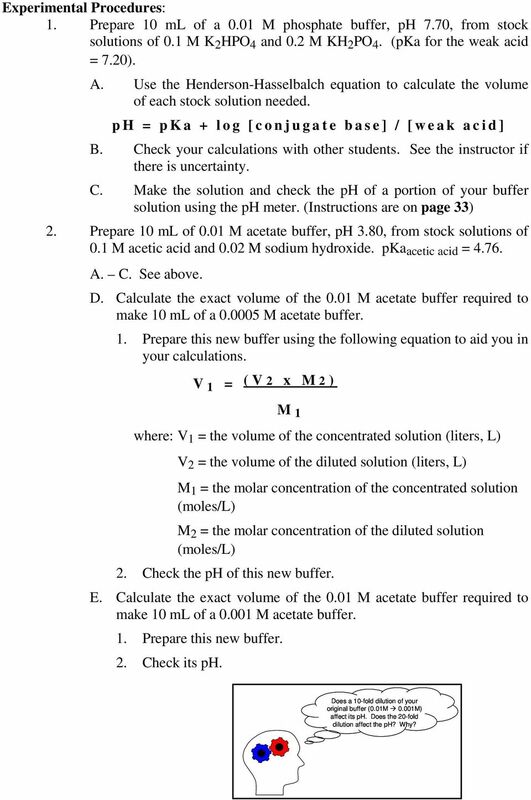 D. Calculate the exact volume of the 0.01 M acetate buffer required to make 10 ml of a M acetate buffer. 1. Prepare this new buffer using the following equation to aid you in your calculations. V 1 = (V2 x M2 ) M 1 where: V 1 = the volume of the concentrated solution (liters, L) V 2 = the volume of the diluted solution (liters, L) M 1 = the molar concentration of the concentrated solution (moles/l) M 2 = the molar concentration of the diluted solution (moles/l) 2. Check the ph of this new buffer. E. Calculate the exact volume of the 0.01 M acetate buffer required to make 10 ml of a M acetate buffer. 1. Prepare this new buffer. 2. Check its ph. Does a 10-fold dilution of your original buffer (0.01M 0.001M) affect its ph. Does the 20-fold dilution affect the ph? Why? 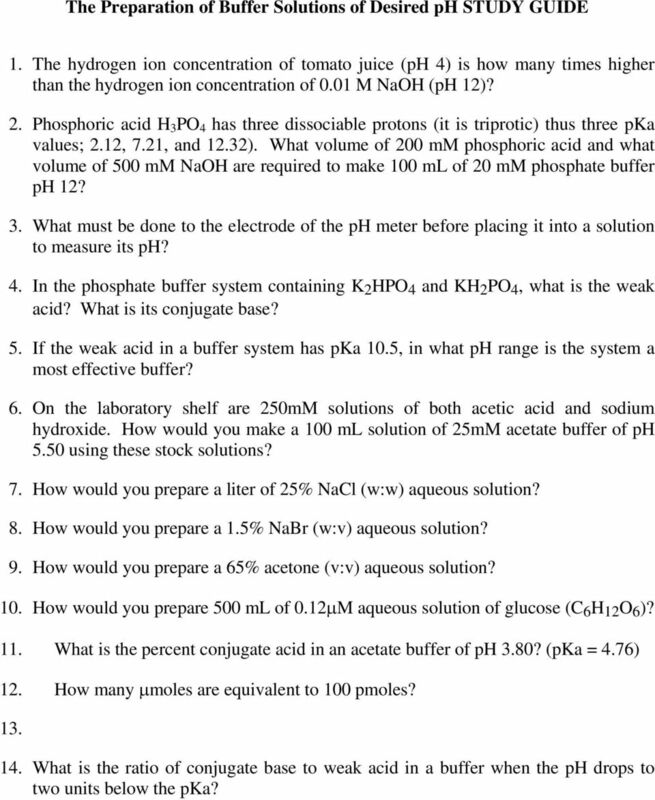 8 The Preparation of Buffer Solutions of Desired ph STUDY GUIDE 1. The hydrogen ion concentration of tomato juice (ph 4) is how many times higher than the hydrogen ion concentration of 0.01 M NaOH (ph 12)? 2. Phosphoric acid H 3 PO 4 has three dissociable protons (it is triprotic) thus three pka values; 2.12, 7.21, and 12.32). What volume of 200 mm phosphoric acid and what volume of 500 mm NaOH are required to make 100 ml of 20 mm phosphate buffer ph 12? 3. What must be done to the electrode of the ph meter before placing it into a solution to measure its ph? 4. In the phosphate buffer system containing K 2 HPO 4 and KH 2 PO 4, what is the weak acid? What is its conjugate base? 5. 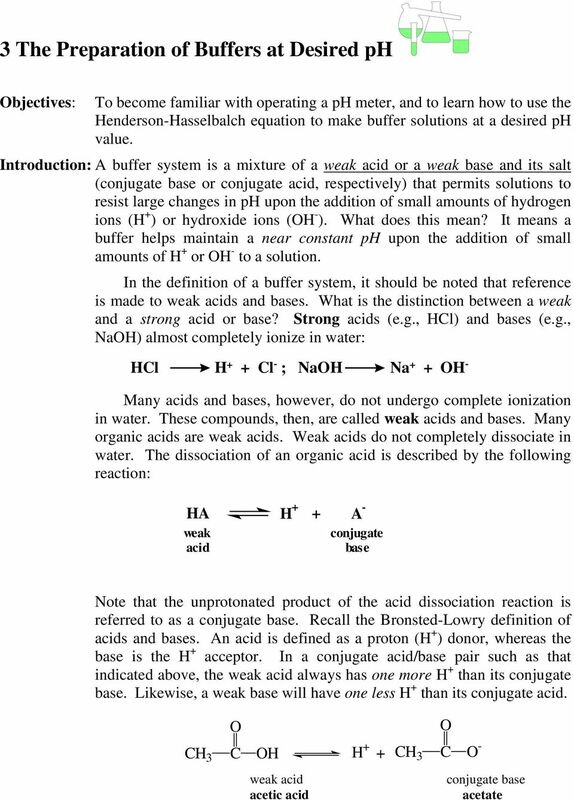 If the weak acid in a buffer system has pka 10.5, in what ph range is the system a most effective buffer? 6. On the laboratory shelf are 250mM solutions of both acetic acid and sodium hydroxide. How would you make a 100 ml solution of 25mM acetate buffer of ph 5.50 using these stock solutions? 7. How would you prepare a liter of 25% NaCl (w:w) aqueous solution? 8. How would you prepare a 1.5% NaBr (w:v) aqueous solution? 9. How would you prepare a 65% acetone (v:v) aqueous solution? 10. How would you prepare 500 ml of 0.12µM aqueous solution of glucose (C 6 H 12 O 6 )? 11. What is the percent conjugate acid in an acetate buffer of ph 3.80? (pka = 4.76) 12. How many µmoles are equivalent to 100 pmoles? What is the ratio of conjugate base to weak acid in a buffer when the ph drops to two units below the pka? Chapter 21 Buffers and the titration of Acids and Bases Shuffle order make 21-3 last! We remember that molarity (M) times volume (V) is equal to moles so this relationship is the definition of the equivalence point. Similarities The ph of each of these solutions is the same; that is, the [H + ] is the same in both beakers (go ahead and count). How many ml of 0.250M potassium permangenate are needed to react with 3.36 g of iron(ii) sulfate? Chemistry 201 Lecture 15 Practical aspects of buffers NC State University The everyday ph scale To review what ph means in practice, we consider the ph of everyday substances that we know from experience.